This article discusses potential problems caused by excessive current asymmetry (unbalance). Part 2 proposes a method for reducing current asymmetry at the wind turbine terminals as well as at the wind farm point of connection. Part 3 demonstrates the improved current balance achieved following phase transposition of the medium voltage feeder circuits on an operating wind farm. In the below text, unless otherwise stated, current asymmetry refers to current imbalance at the wind turbine LV terminals. Where values are shown, they are in amps and are defined in terms of the phase with the highest current minus the phase with the lowest current (i.e. not the IEC definition of negative sequence current). While problems such as generator heating are more closely correlated to the level of negative sequence quantities, these measurements were not available from the wind turbine SCADA system. A number of factors may motivate a wind farm operator to attempt to reduce current asymmetry both at the wind turbine level and the overall wind farm level (i.e. the current imbalance exported onto the grid). A likely incomplete list is given below. Many wind turbine generators are based on induction machines. Heating increases with current asymmetry due to circulating currents in the rotor. The increased heating can reduce generator life expectancy and cause temperature-induced constraints (and lost production) during periods of high ambient temperature, when the spot price is often at its highest. For more on how voltage asymmetry (closely related to current asymmetry) affects induction machines refer to Technical Resources. Generators are obliged to ride through grid disturbances up to agreed limits. In Australia, these limits will usually be based on Schedule 5 in the National Electricity Rules. Wind farms must remain connected to the grid for levels of voltage imbalance defined in the generator performance standards. Voltage imbalance on the transmission system will result in voltage imbalance at the turbine terminals which in turn causes current asymmetry. If there is already a significant amount of current asymmetry under normal conditions, there will be less margin before the trip level and therefore the wind farm’s chances of successfully remaining connected to the grid during contingency conditions will be decreased, possibly to a level of non-compliance. Current asymmetry in induction machines decreases torque. This could cause the turbine’s powercurve to move down slightly, resulting in lost production. The efficiency loss is likely greatly influenced by the generator technology but it is conceivable that there will be an efficiency decrease not just for variable-slip induction machine generator technologies (here is a good PDF containing descriptions of the different wind turbine generator technologies) but also for DFIG (partial converter), full converter and permanent magnet generators. If current asymmetry is particularly bad, wind turbines may experience frequent protection trips due to current asymmetry. Aside from the compliance implications discussed above, this results in decreased availability, and given that downtime due to grid-related alarms is usually allocated against the wind farm owner, such downtime is particularly important to avoid, given it is not covered by the availability guarantee. Voltage asymmetry can cause current asymmetry, but the opposite is also true – for example if current is consistently higher on one phase at the turbine level, current will also be higher at the medium-voltage level. This results in a larger voltage drop on that phase between the turbines and the substation. This voltage unbalance can be exacerbated by a long wind farm collector group – which has impedance over which voltage drop will occur. 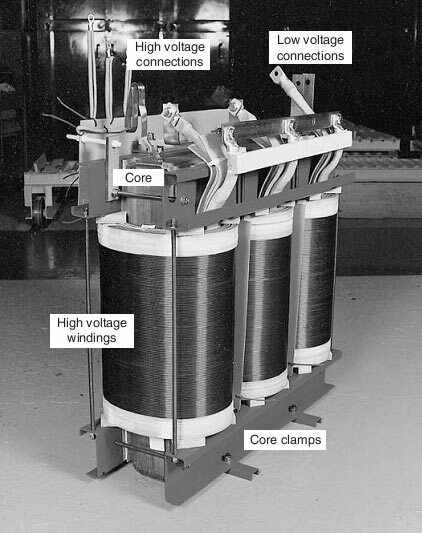 If the wind farm operates under voltage control (injecting or absorbing reactive power to try to meet a voltage target at the point of connection), then usually such a voltage control will act based on the phase furthest from the target. Using reactive power for voltage control will increase wind farm losses if it causes the wind farm to move further from operation at unity power factor. 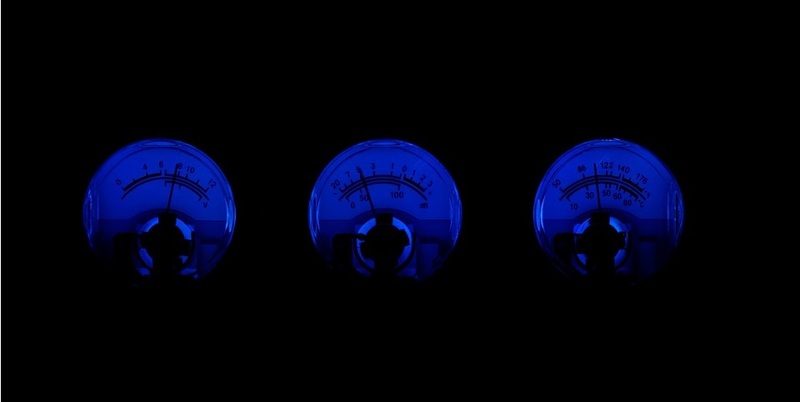 There is an efficiency incentive to operate with a balanced voltage at the point of connection (or point where voltage is controlled) – all three phases will move closer to the average, increasing the voltage on the lowest phase and decreasing the voltage on the highest phase. This will move the error signal (driving the voltage control scheme) closer to the setpoint. This in turn reduces the amount of reactive power requested from the voltage control system and may decrease the losses due to reactive power flow. If there is a high level of current asymmetry within the wind farm, it may exacerbate voltage asymmetry at the point of connection. If the wind farm current asymmetry is causing voltage asymmetry, it may be possible to balance the wind farm MV and HV busses through phase transposition (refer to Part 2 -Improving Current Asymmetry on Wind Farms). The cumulative effect of a large quantity of identical wind turbine transformers, all with the same impedance imbalance. This is a good paper describing transformer load loss asymmetry which could contribute to current asymmetry on a wind farm. LV cabling forming part of the cable loop (to allow the nacelle to rotate without over-twisting the cables). 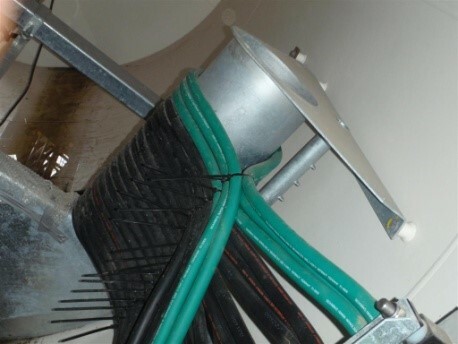 Note the cable is not run in trefoil groups – significant lengths of high-current-carrying cable can have a cumulative effect across the wind farm and can contribute to impedance imbalances and current asymmetry at PCC. Current asymmetry can be reduced through carefully selected phase transpositions – a concept that is not new but appears to be rarely considered during wind farm construction. A recommended approach to phase transposition is discussed in Part 2 while measurements from a wind farm where phase transpositions were performed are discussed in Part 3.